BordO2 Dopamine Blue VG E-Liquid - Money Off! The BordO2 Dopamine Blue VG E-Liquid will satisfy your sweet tooth and wake up all your senses. The juicy blend of raspberries and menthol is deliciously sweet, while the minty kick makes sure you feel refreshed and ready to take on the day. BordO2 is a French based company who use experts in food and wine to ensure the best flavour for their e-juices while focusing on class and quality. Dopamine Blue VG E-Juice is available in a pack of two 10ml bottles with three different nicotine strengths for your personal preference. All bottles are supplied with a child-proof applicator. Some of our stock of the BordO2 Dopamine Blue E-Juice is nearing its expiry date and, in light of this fact, we are offering the affected stock for a discounted price of £4.50. Act quickly, as this offer is only available while stocks last! Dopamine Blue VG is an explosion of fruity flavours, with a refreshing minty undertone. The sweet taste of raspberries offers a delicious experience, while the added menthol kick provides a refreshing finish that is perfect for early mornings and long nights. Dopamine Blue VG has a combination of 80/20 (VG/PG) for a smooth vaping blend. If you prefer a lower VG level, try out the Dopamine Blue for the same intense flavour but a blend of 50/50 VG/PG. 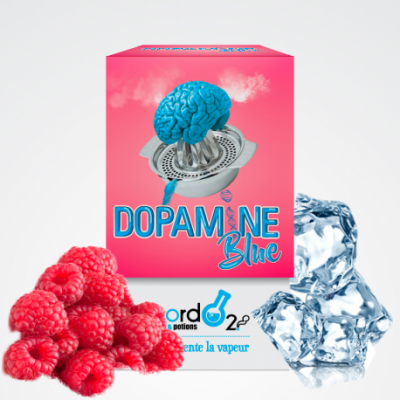 BordO2 Dopamine Blue VG E-Liquid is supplied in a pack of two 10ml bottles only. BordO2 Dopamine Blue VG E-Juice is available with a 3mg strength only.